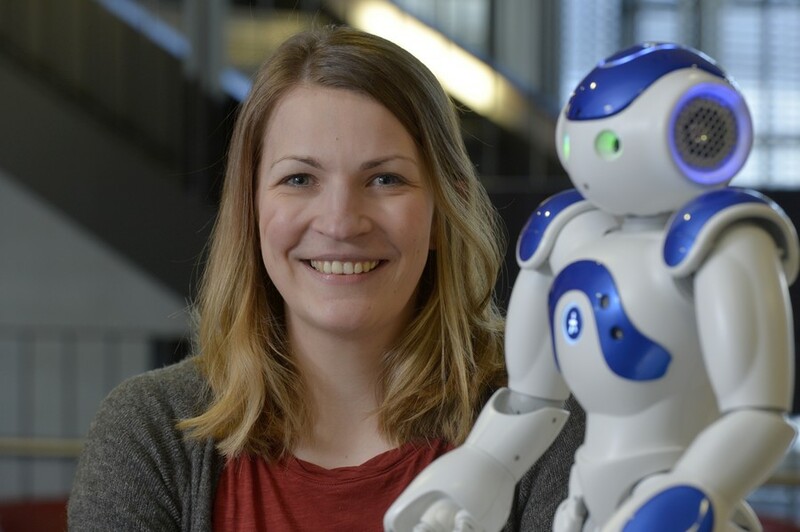 Dr. Laura Hoffmann is working on two projects that deal with robots and their interaction with children. One project addresses how a robot can learn to direct children’s attention, while the other deals with the question of how the robot can keep children’s attention while they are learning a foreign language. How do people react to technology? How can a robot command a child’s attention when it is trying to motivate that child to learn? And how can robots be used to help children learn a foreign language? CITEC researcher Dr. Laura Hoffmann explores questions such as these in her research at the intersection of psychology and computer science. Hoffmann is a member of the “Social Cognitive Systems” research group, which is part of the Cluster of Excellence CITEC and the Faculty of Technology at Bielefeld University. The research group is headed by Professor Dr. Stefan Kopp. One of the projects Dr. Hoffmann is working on is called BabyRobot. The project is being funded by the European Union in the framework of the “Horizon 2020” research program. In addition to Bielefeld University, other partners from all around Europe are also involved in the project. “The point here is for a robot to learn how it can draw children's attention, for example, to animals displayed on a tablet,” says Hoffmann. 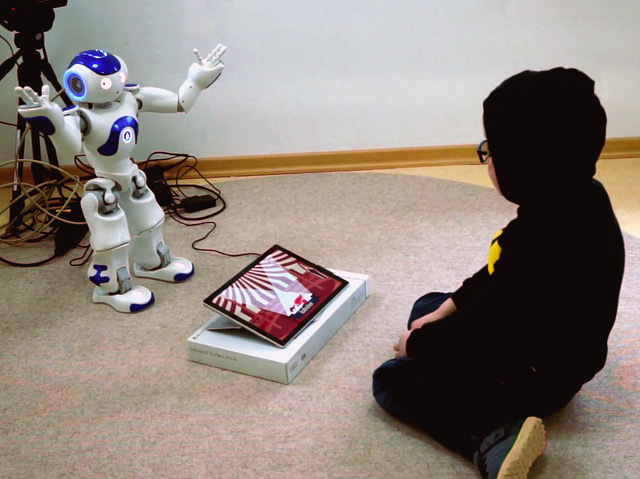 The robot interacts with children between the ages of 5–10 and observes their behavior using its sensors. The robot can communicate by gazing, speaking, and gesturing. “Here, the robot tests out different strategies,” explains the researcher. The robot learns, for example, that it is enough to say the name of the animal when only one type of animal is shown, but it is more helpful to combine saying the animal’s name and gazing at the animal’s position when several animals of the same kind are depicted. During their interaction, the robot tests which strategies help a child to find an object on the tablet without many attempts. The point of this is to help understand which instructions children prefer. “The idea here is that the robot discovers the world as a baby does. For this, the robot incorporates the children’s behavior and learns from them,” says Hoffmann. In the future, the robot is also meant to be able to work with two children at the same time and to mediate between them while playing. Another project that Laura Hoffmann is participating in is called L2TOR, which is also funded as part of the Horizon 2020 research program. “The goal here is to have a robot assist in learning a foreign language as a friendly learning companion,” says the researcher. L2TOR (pronounced as “El Tutor”) is aimed at pre-school aged children. “The idea behind this project is to make it easier for children with a migration background to learn a second language.” For this, the children work one-on-one with the robot to address their individual needs. In addition to the robot, the children also use a tablet. “They first meet the robot as a group, and they do a duck dance with it," explains Hoffmann. This allows the children to rid themselves of any potential shyness with the robot before they have their individual learning sessions with it. The robot offers the children learning games with different scenarios. In one game, they see, for instance, a flower shop. “This involves counting the flowers or moving them from right to left on the screen according to the robot's instructions,” says Hoffmann. This helps the children to learn numbers and words like up, down, left and right. 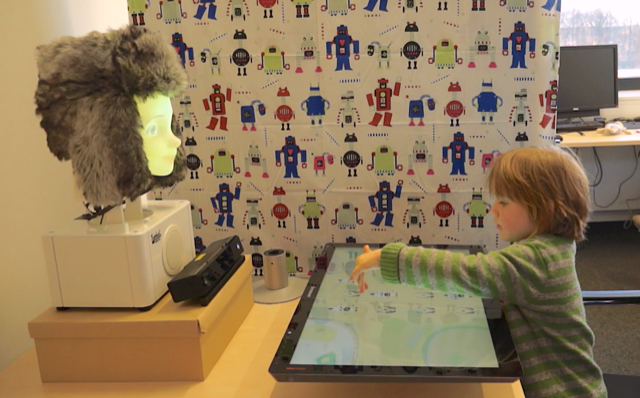 The robot is meant to be able to regain a child’s attention if their focus drifts off. “To this end, we worked with preschool teachers whom we showed different situations,” explains Hoffmann. They were then asked to give tips about how they would react in the different situations in order to re-engage the children in the interaction. This enables the robot to select and modify tasks on the basis of its existing knowledge. The robot can also end the interaction earlier than planned if a child has learned enough. “This is so the child doesn’t get bored,” says Hoffmann. On the other hand, the robot repeats vocabulary that is difficult for the child more frequently. “We’ve found out that it’s very important for the robot to explain why it is doing something, especially to slower learners,” says Hoffmann. Otherwise, a program like this would quickly be perceived as unsettling. The researchers are currently working on what this might look like in concrete terms.